You are currently browsing the tag archive for the ‘Bonsai soil sifter’ tag. Well, re-potting season is a while off here in Australia but while I was in Japan I did spot something that might speed up the whole process when the time does come around. 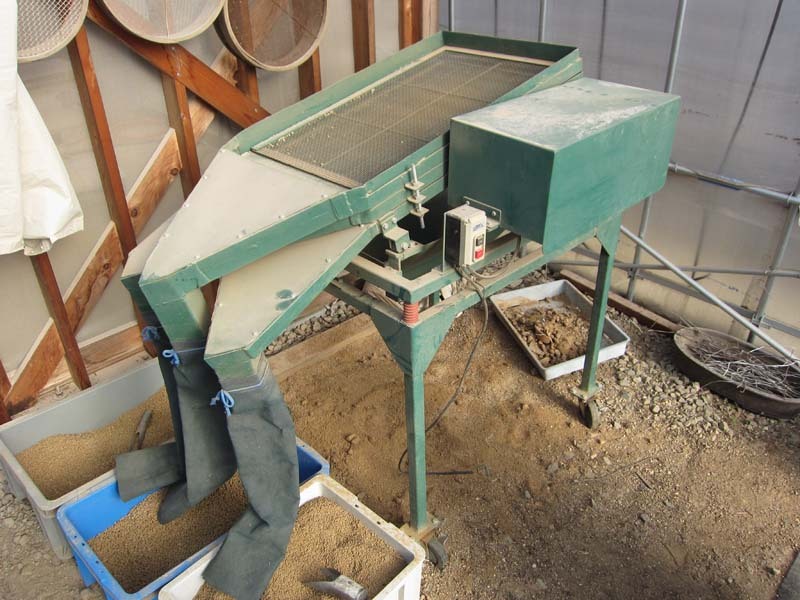 In one of the green houses at the back of Taisho-en I spotted a sifting machine. I have a small hand sifting set at home which takes me ages to sift enough material to do a hand full of trees. I am sure with a machine like this I could do the whole collections worth of soil in no-time! From what I could tell it was a simple contraption with 3 sizes of mesh screens that gently shook to give you 3 graded sizes of soil and the unwanted dust simply fell through to the floor. It might be a good machine for someone who doesn’t have a team of apprentices to do the sifting for them!